Gunners fans signing up for an account at the Coral Sportsbook should use the Coral Sports Promo Code, which will earn you a £20 reward in form of 4 bonus bets worth £5 each (T&Cs Apply). We opted in for the offer to claim the benefits and discover what the bookie is all about – here’s the All Arsenal review. What is Coral Sports Promo Code? 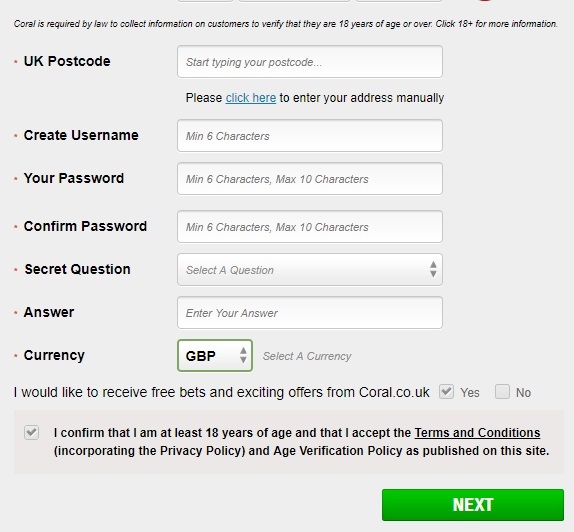 The Coral Sports promo code is the bonus code that we activated to get the rewards that come with the welcome offer. (T&Cs Apply) Below is a table highlighting all the details of this new player package. The bonus does not apply to users of Paysafe, Skrill, Neteller or Moneybookers. Just to be safe, you should make it a point of reading the other terms and conditions of the site as they also apply for the welcome package. Coral have give Gunners fans some fantastic odds throughout the season, but now that it’s over it’s time to take stock, enjoy a summer of World Cup betting, and then await the release of next season’s fixtures. Coral offered Arsenal odds on over 160 betting market options in Premier League games in the season just finished, so we’re really excited to see what we’ll get from the bookmaker with a new season and a new manager at the helm. Coral sportsbook offers all its players a wide variety of games to choose from. After claiming the offer from the Coral promo code, we were able to access numerous international matches covered from all over the world. There were also many betting markets in each and every game, which made it easier for me to place my desired bet. We also enjoyed the quality odds offered by Coral Sports on their betting markets. The live streaming feature is great, with over 2,000 games aired every single week. This was a lot of fun as we could catch up on some sport events while on the site. Another electrifying feature about the sporting events was the in-play betting that enabled us to place my bets during a live Arsenal match. Other great features include the Acca insurance, football coupons, rapid-fire markets, enhanced markets and specials. Some of the sporting events offered at the bookie include: E-sports, football, golf, horse racing, motor sports, and even virtual sports. With Coral mobile, we could bet anytime that we wanted, whether on the move or just lazing around at home. To test the user friendliness of the mobile site, we start by using the browser in a smartphone and in all honesty things were quite smooth. For the individuals who prefer betting with a native app on mobile you can download the Coral mobile app from your respective app stores – be it Android, iOS or Windows Phone operating systems. On reflection of our betting experience at Coral sportsbook, we can confidently say that this is a bookmaker you can definitely make your home of Arsenal betting. Sign up for an account at Coral Sports using the Coral Sports Promo Code to be able to enjoy the Coral sports sign up offer (T&Cs Apply). With the live streaming feature and the in-play betting, accessible on the full site and on mobile, this bookie is definitely a great choice for Gunners fans!